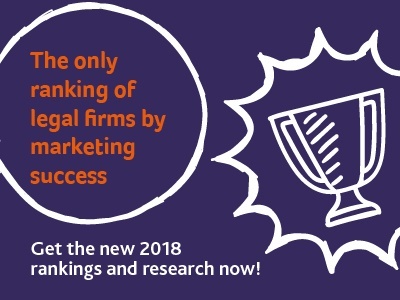 MANCHESTER law firms continue to lead the way in terms of digital marketing prowess in the Northwest, according to new research published today. Forty-six key ranking factors were measured in the second annual ‘Who’s leading the sector’ report which ranks digital marketing activity by law firms across the region in 2018. Fifty top law firms across the Northwest were subjected to close scrutiny of their digital marketing activity by ClientsFirst. The Macclesfield-based growth marketing agency used a custom-built, quantitative marketing grader and independent tools including Moz, Alexa and Google to rank all fifty firms. JMW came out on top for the second year running, followed by Gorvins and Weightmans. The latter climbed significantly, up from 14th last year to a top three finish this year and a score of 68.1 out of 100. All three firms scored highly on content creation quality, search engine visibility and social reach. A key theme for law firms ranking highly this year was proactivity of uploading regular ‘thought leadership’ content and managing public reviews on sites like Google and Trustpilot. 72% of firms have gained at least some reviews on Google, but only 10% have a significant number of positive reviews. LinkedIn and Twitter are both used by 94% of firms, up by 14% and 9% respectively on last year. 46% of firms are yet to implement Secure Sockets Layer (SSL) on their website which is a standard security technology for establishing an encrypted link between a server and a client – and a direct Google recommendation. This year’s top ten shares four names with last year’s top ten, sees four firms climb into the top ten from lower down the table and includes two firms who were not included in last year’s analysis. Perhaps most impressively, FDR Law climbed 28 places and more than doubled their score from last year, achieving a total score of 63.45. “This is the second year we have researched the level of digital marketing activity in the North West legal sector and it reveals evidence that many firms have significantly upped their game in just a single year. Our findings reveal that inbound marketing techniques are increasingly being favoured over outbound marketing techniques. “In our continued assessment and judgement, inbound continues to present the largest opportunity for professional services marketers to generate new leads for their firms, as well as furthering other marketing goals such as engagement and awareness. “We are delighted to be once again ranked as the leading law firm for digital marketing in the North West by ClientsFirst. Over the last number of years we have continued our investment across all areas of digital marketing and all departments have been encouraged to focus on what can be achieved online no matter where particular area of law they practice. It is refreshing to be working with our digital agency, I-COM, who have a firm understanding of the legal profession but also the behavioural characteristics of prospects online. “We are delighted to have, not only ranked so highly again, but increased our position from three to two for digital marketing since last year’s results. As a firm, digital marketing has been an area we have continued to grow and develop over the past few years. “Our digital marketing strategy is all about differentiation. Our aim is to provide something different to clients and the digital community, from the informative to the creative, we want people to think of Gorvins as a leading, innovative law firm.